2.12. Global obesity rates have tripled since 1975, and the UK ranks among the worst in Europe . Obesity and poor diet are linked with type 2 diabetes, high blood pressure, high cholesterol and increased risk of respiratory, musculoskeletal and liver diseases. Obese people are also at increased risk of certain cancers, including being three times more likely to develop colon cancer. 2.13. Nearly two-thirds of adults in England are overweight or obese. In 2016/17, 617,000 admissions to NHS hospitals recorded obesity as a primary or secondary diagnosis ,. 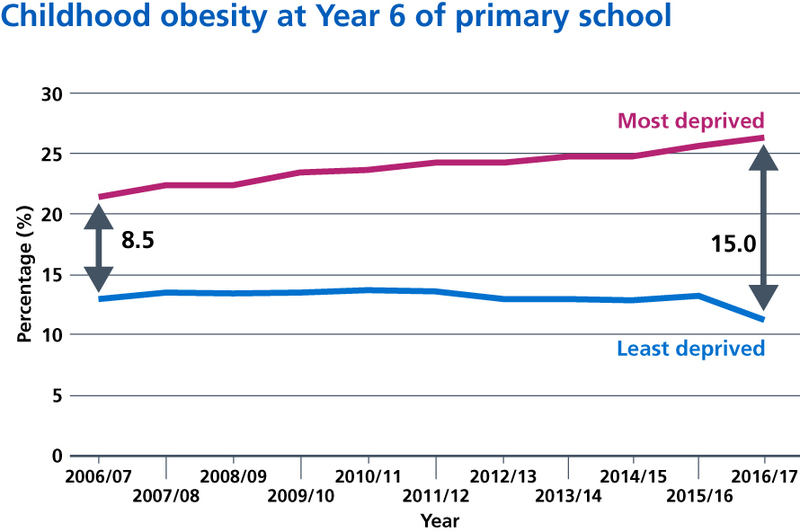 A third of children leaving primary school are overweight or obese and, on average, consume up to 500 extra calories per day. Children are heavily exposed to television advertising for food and drinks high in salt, fat or sugar ; fast food shops are a growing presence on high streets  and increasingly cluster around schools . The government has pledged to halve childhood obesity and significantly reduce the gap in obesity between children from the most and least deprived areas by 2030. 2.14. The burden of obesity isn’t experienced equally across society . The NHS will therefore provide a targeted support offer and access to weight management services in primary care for people with a diagnosis of type 2 diabetes or hypertension with a BMI of 30+ (adjusted appropriately for ethnicity), where we know we can have a significant impact on improving health, reducing health inequalities and reducing costs. By 2022/23, we also expect to treat up to a further 1,000 children a year for severe complications related to their obesity, such as diabetes, cardiovascular conditions, sleep apnoea and poor mental health. These services will prevent children needing more invasive treatment. 2.15. The NHS Diabetes Prevention Programme supports those at high risk of type 2 diabetes to reduce their risk. A joint commitment by NHS England, Public Health England (PHE) and Diabetes UK, the programme is the largest undertaking of its kind in the world and over 100,000 people have already benefited since its introduction in 2016. In many areas demand has outstripped supply, and it has proven highly effective. We are now committing to fund a doubling of the NHS Diabetes Prevention Programme over the next five years, including a new digital option to widen patient choice and target inequality. 2.16. The risk of developing type 2 diabetes is up to six times higher in certain Black, Asian and Minority Ethnic (BAME) groups. Expanding the Diabetes Prevention Programme is a key vehicle for tackling health inequalities, with a significantly higher take up from BAME groups than the general population. We will also continue to support local health systems to address inequality of access to multidisciplinary foot care teams and specialist nursing support for people who have diabetes. 2.17. Medical research has shown that some people with type 2 diabetes can achieve remission through adoption of a very low calorie diet. This allowed nearly half of patients to stop taking anti-diabetic drugs and still achieve non-diabetic range glucose levels . We will therefore test an NHS programme supporting very low calorie diets for obese people with type 2 diabetes. 2.18.The NHS will continue to take action on healthy NHS premises. In 2016, NHS England introduced a financial incentive for hospitals to encourage healthier food options to be available for staff, limiting the proportion, placement and promotion of foods high in fat, salt and sugar (HFSS). Our action has also reduced the sale of sugar-sweetened beverages across the NHS, from 15.6% in July 2017, to 7.4% in June 2018. The next version of hospital food standards will be published in 2019, strengthening these requirements and pushing further in securing healthy food for our staff and patients. They will include substantial restrictions on HFSS foods and beverages. All trusts will be required by the NHS standard contract to deliver against these standards. 2.19. Nutrition training, and an understanding of what is involved in achieving and maintaining a healthy weight, varies between medical schools. Some courses have just eight hours, at most, over a five- or six-year degree. This is not about doctors becoming nutritionists or dieticians. It is about making sure staff on the frontline who are in contact with thousands of patients a year feel equipped to talk to them about nutrition and achieving a healthy weight in an informed and sensitive way. They should feel able to refer patients appropriately in cases where a nutrition support could help, if they are overweight, and have type 2 diabetes, or high blood pressure for example. Together with the professional bodies and universities we will ensure nutrition has a greater place in professional education training.